Updated: May 22, 2012: Unfortunately, after an initially hopeful and seemingly objective admission by journalist Pravit Rojanaphruk of "The Nation," a frequent contributor to US-funded "rights advocate" Prachatai, he has lapsed back into working in tandem with the US State Department-funded propaganda front, and has even attended a recent Prachatai "anniversary" party. Earlier this year, Pravit had admitted that Prachatai was hypocritically censoring their own "free speech" forum, while in the midst of a heated campaign to expose violations of "freedom of expression" in Thailand. While Pravit has been a prolific "freedom of expression" activists, condemning and doggedly vilifying those he claims are guilty of violating "human rights," he has hypocritically overlooked Prachatai's behavior in the tried and true form of a professional propagandist peddling a politically motivated agenda, merely under the guise of promoting "human rights." Previous Update: February 13, 2012: To Pravit Rojanaphruk's credit, journalist at The Nation and frequent contributor to US-funded "rights advocate" Prachatai, he has pursued and confirmed that indeed Prachatai was censoring their own "free speech" advocacy website. Seemingly unsatisfied with Prachatai's tenuous excuse that they were only removing "spam and troll" comments, Pravit stated the incident had diminished his respect for the organization. Hopefully this streak of objectivity and honesty will encourage others to disassociate themselves from Prachatai and replace it with a truly politically neutral, objective, and entirely indigenous organization that will genuinely advocate freedom, instead of hiding a foreign-funded political agenda behind such noble ideals. January 16, 2012 - Prachatai describes itself as "an independent, non-profit, daily web newspaper established in June 2004 to provide reliable and relevant news and information to the Thai public during an era of serious curbs on the freedom and independence of Thai news media." Their objectives include, "to promote active public participation in Thai news media." The "independent" daily web newspaper does indeed make daily posts with information taken from organizations with heroic sounding names, including "Freedom House," "Human Rights Watch," "Amnesty International," and the "International Federation for Human Rights," with almost all of their stories centered around anti-censorship, pro-free speech and pro-democracy topics. At Prachatai.com, one would think it would be the last place to fall victim of the very same censorship they fight against daily. In reality, it is one of the first places to expect such double standards. In reality, Prachatai abjectly lies about being "independent." In fact, they are fully funded by the US State Department via the National Endowment for Democracy (NED) and USAID, Wall Street banker George Soros' Open Society and Media Development Loan Fund (MDLF), the Rockefeller Foundation, and the German government's Heinrich Böll Foundation. It was only last year, in 2011, that this information was made available to the public, and only after months of working to expose and hold Prachatai accountable. 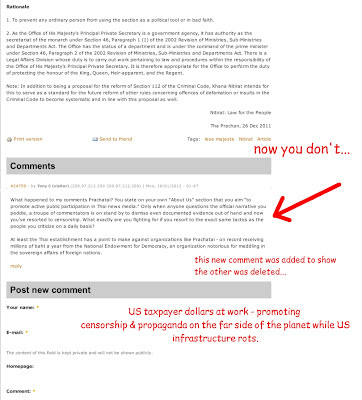 And while Prachatai now partially discloses its funding, claiming that, "it is important to state here that none of our foreign donors has ever put up any demands connected to the funds they provided, nor did they ever interfere with our reporting," in full acknowledgement of just how bad it looks - they have yet to address legitimate concerns regarding the nature of their funding and their true agenda. Prachatai is just one of many disingenuous, insidious NGOs fully funded by Wall Street and London around the world carrying out an agenda of global hegemony by displacing national institutions with homogenous "civil society" directed by the global elite - all done behind the veil of "freedom" and "democracy." As a rights advocate, Prachatai is portrayed by many, including the BBC, as a "liberal news website." They portray themselves as anti-establishment and pro-people power. It might then be a legitimate question to ask why they accept money from foreign organizations representing interests and agendas running directly against such an image. Nothing could be further from "people power" than Neo-Conservative, warmongering, big-business, corporate-fascists lining the board of directors of a disingenuously named organization like the National Endowment for Democracy. How then is it not immense fraud for Prachatai to take money from these people, year-to-year, and still pose as "independent" or "liberal" or even a "rights advocates?" It can be argued that the board of directors of NED represents many involved in the most egregious transgressions against human rights and national sovereignty in recent human history. It gets worse though. NED not only has a suspicious board of directors, they have a long nefarious history that has been criticized by real progressives for decades. In 1993, Noam Chomsky spoke of NED's activities in Nicaragua stating, "it's an attempt to impose what is called democracy, meaning rule by the rich and the powerful, without interference by the mob but within the framework of formal electoral procedures." Australia's Southern Cross University's "Activating Human Rights & Peace (AHRP)" conference had put out a revealing account of their 2008 proceedings which stated that NED was carrying out "a lot of work that was formerly undertaken by the CIA." Last year, during the "Arab Spring," disingenuously portrayed as spontaneous pro-democracy uprisings, it was later revealed in the New York Time article,"U.S. Groups Helped Nurture Arab Uprisings," that the National Endowment for Democracy played a key role in training, funding, and equipping protesters long before the first uprisings unfolded. For nations that fell to NED's insidious meddling, it wasn't democratic leaders that came to power, but instead NED's own operatives like Moncef Marzouki in Tunisia, or a representative of Wall Street-London corporate-fascism like Abdurrahim el-Keib, now prime minister of Libya and a long time representative of the BP, Shell, Total-funded Petroleum Institute. It should be noted that in tandem with NED, worked George Soros' Open Society, either co-funding NED's various global initiatives, or funding similar projects in parallel. It is therefore very troubling to see Prachatai in Thailand, funded by these same disingenuous criminal conspirators, and not answering fully for what they are doing. 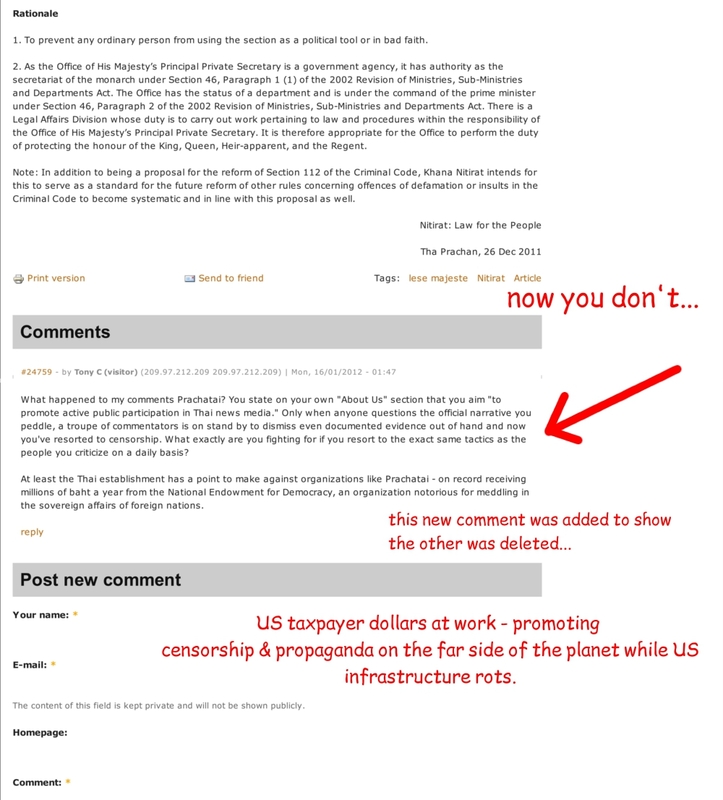 Of course, if Prachatai is truly an agent of the US State Department it should surprise no one that they would censor and ban anyone in their forums exposing such a fact or challenging the narrative and false consensus they attempt to generate in yet another campaign to divide and destroy a sovereign nation. For months Land Destroyer has been regularly posting alternative views on Prachatai - always confronted with a unified campaign from alleged Prachatai readers to discredit and deny even facts taken directly from Prachatai's own "About Us" page. 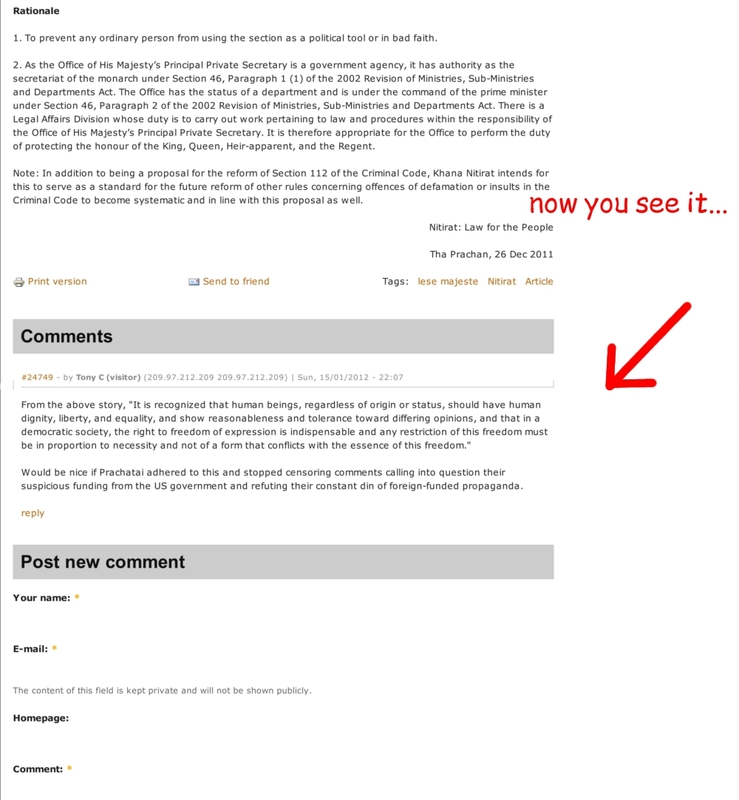 Additionally, there have been concerted calls for censoring, "boxing off," and "muzzling" contrary views before finally, this week, Prachatai began an aggressive campaign to delete any new comments posted that contradict their propaganda. Not only this, but apparently planted commentators are claiming that such censorship is not taking place. It is a simple matter, however, to capture webpages as .pdf's and show the "before and after" affects of Prachatai's censorship. 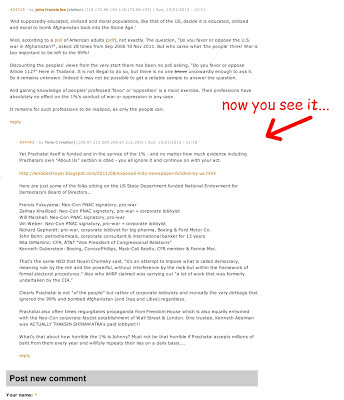 Below is just two examples and readers are encouraged to go to Prachatai.com/english and join the debate, if only to expose one part of the US State Department's vast global propaganda network and see just how US tax dollars are being wasted around the world. 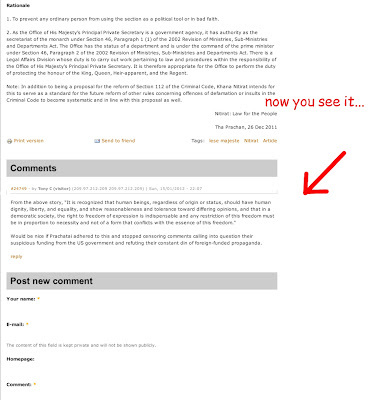 Vulgarity was not used, the comments either addressed directly the subject matter of the article or comments left to stand in Prachatai's comment section. Still, they were removed, as were dozens more in just one evening. 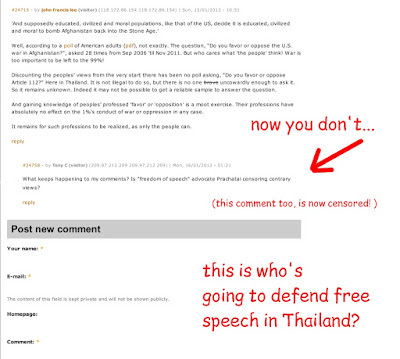 Prachatai had been piecemeal censoring comments for months so as to blunt certain messages but to make it appear "freedom of speech" was still being observed. A chorus of abusive commentators would ridicule any suggestion that Prachatai was censoring, but now we have definitive proof that indeed they are. 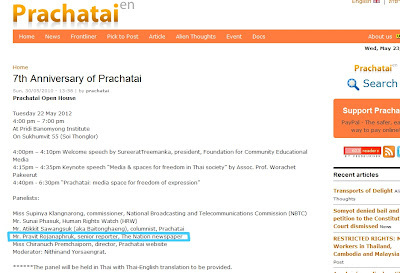 If Prachatai isn't promoting freedom of speech or democracy, what are they promoting? At the heart of the matter involving Prachatai, is of course the conduit it serves as for Washington and Wall Street to enter and despoil Thailand. As in Egypt, where Egyptian traitor Mohamed ElBaradei was literally sitting on the board of trustees of a US think-tank while leading a US-staged uprising in his native country, Thailand too has a stooge of choice. That stooge is Thaksin Shinawtra. And just as Egypt had mobs of cannon fodder taking to the streets on behalf of ElBaradei’s US-backed uprising, so does Thaksin via the “red shirt” United Front for Democracy Against Dictatorship (UDD). And just as Egypt’s April 6 street mob leadership was literally face -to-face with the US State Department and US corporate interests, so too was Thailand’s UDD leadership. Photo: Deposed Thai prime minister, Thaksin Shinawatra on the even of the 2006 military coup that would oust him from power. Since 2006 he has had the full, unflinching support of Washington, Wall Street and their immense propaganda machine in his bid to seize back power. Thaksin Shinawatra, Thailand’s prime minister from 2001 until a military coup removed him in 2006, was a former Carlyle Group adviser and was literally reporting to the globalist Council on Foreign Relations in New York City on the eve of his ousting from power. While in office, Thaksin attempted to ramrod through the US-Thailand Free-Trade Agreement (FTA) without parliamentary approval, a 2004 FTA backed by the exact same US-ASEAN Business Council recently visited by Thaksin’s UDD street mob leaders in April of 2011. 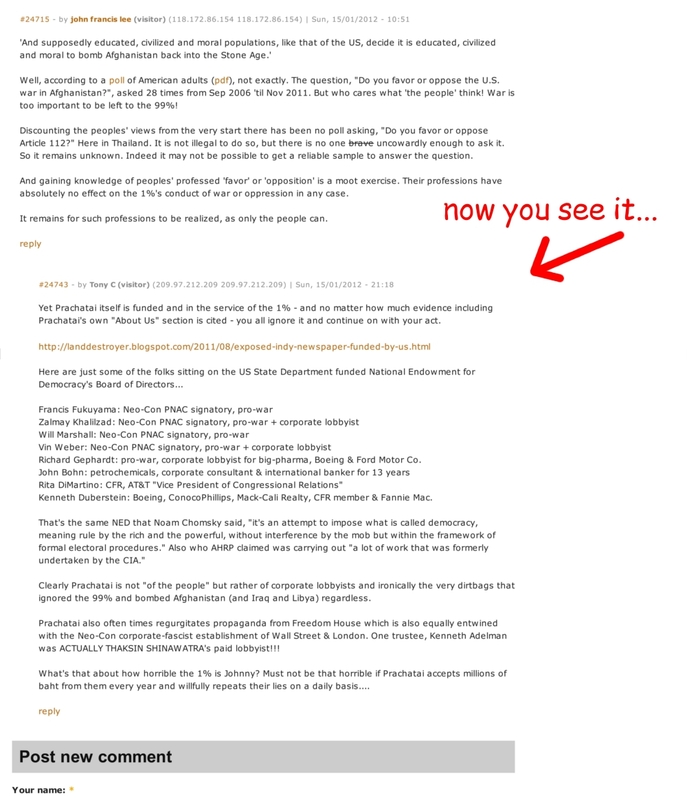 The council in 2004 included 3M, war profiteering Bechtel, Boeing, Cargill, Citigroup, General Electric, IBM, the notorious Monsanto, and currently also includes the criminal banksters of Goldman Sachs and JP Morgan, Lockheed Martin, Raytheon, Chevron, Exxon, BP, Glaxo Smith Kline, Merck, Northrop Grumman, Monsanto’s GMO doppelganger Syngenta, and Phillip Morris. These corporations are more synonymous with mass-murder, mass-corruption, war, and human suffering than any of the “democratic” and “open society” ideals Thaksin, his UDD, or Prachatai claim to be “bringing” to Thailand. 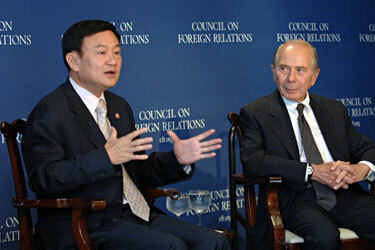 Since the 2006 coup that toppled his autocratic regime, Thaksin has been represented by US corporate-financier elites via their lobbying firms including, Kenneth Adelman of the Edelman PR firm (Freedom House, International Crisis Group, PNAC), James Baker of Baker Botts (CFR), Robert Blackwill of Barbour Griffith & Rogers (CFR), Kobre & Kim, and currently Robert Amsterdam of Amsterdam & Peroff (Chatham House). Meanwhile, his “red shirts” UDD street mobs have received rhetorical support by US-funded NGOs like Prachatai. Quite clearly if the West is to get Thaksin ably behind the levers of power to make the sort of changes Washington and Wall Street desire, Thailand’s establishment must be further undermined, while the opposition is somehow rehabilitated. Enter Prachatai and the UDD who have made careers of obfuscating facts and misleading people to this end. While both hide behind the veneer of standing for “democracy” "free speech" and “human rights,” we can see that those behind them stand for no such things. Prachatai is forced to sustain their elected narratives by obfuscating, circumventing, and otherwise avoiding a long list of well documented facts that damn their arguments as wholly illegitimate. Logically, the best of all options for them is to simply silence anyone bringing these documented facts to the table. 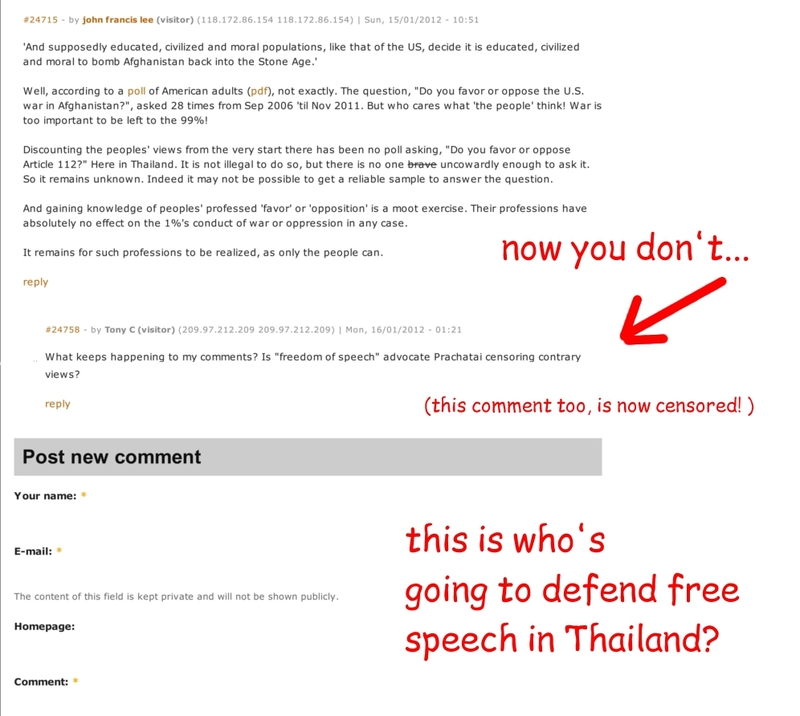 This is how a "rights advocate" like Prachatai who claims to be "anti-censorship/pro-free speech" ends up censoring their own forums. This is the irony wrought from deceit. Editor's Note: It would suit those in Thailand's political landscape who wish to at least perpetuate their fraud a few steps further than Prachatai, to speak out against this overtly hypocritical and cause-damning move to censor what is supposed to be an anti-censorship website. This includes the likes of Pravit Rojanaphruk, a journalist at the Nation who openly admits to contributing to Prachatai and has attempted to whitewash their acceptance of foreign money. 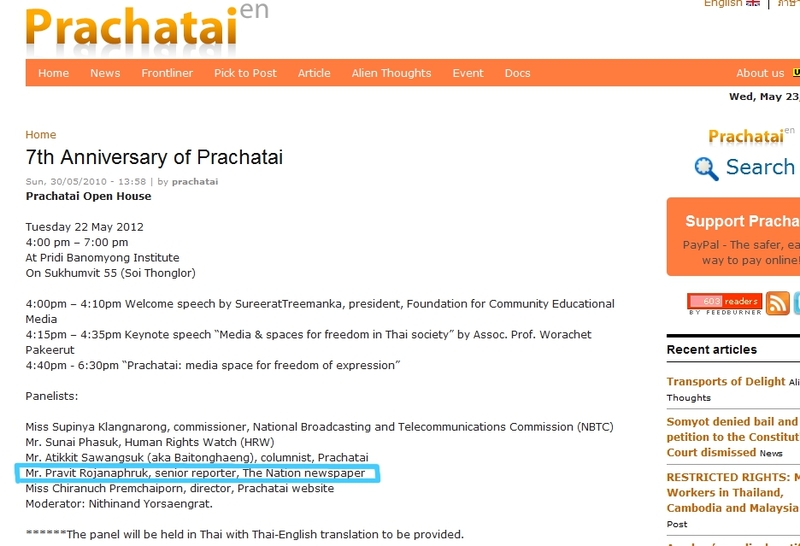 Should he remain silent after his latest "rights editorial crusade" Prachatai's hypocrisy becomes his own. This also includes Prachatai's founder, John Ungpakorn, who has since disassociated himself from the organization but still tacitly supports their activities. To his credit, he did join in calling Prachatai to disclose their funding.